The long and the short of it. Booties come from the 2006 pattern a day calendar and the cuff can be worn up or turned down. Very, very easy. The yellow socks are my first finished toe up socks. Easy 6 stitch pattern. I can see lots of room for improvement, but I did them. All others have been ripped. Well, off to knit now! Ask and It shall be done! 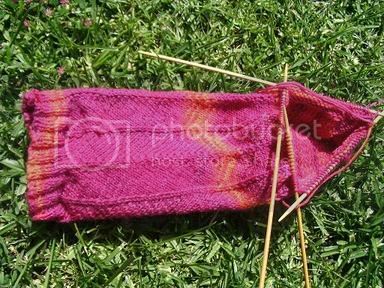 There I was, surfing though some blogs and came across the Jaywalker KAL web page and wombled through it and found all sorts of people on it :) . There was I was thinking to myself - "I need a Toe-up pattern for that" and BLINK! Natalia Knits had sorted it out for me! So that's what I will be doing. I have already started a pair in some lush Knitpicks yarn. They are so lush! Not very summery here in Sydney this weekend. In fact, my outdoor thermomenter showed 14° all yesterday. However, I'm still on the yellow toe up socks pictured earlier. Done the foot and heel of the second sock and am progressing up the leg. And do booties count as socks? 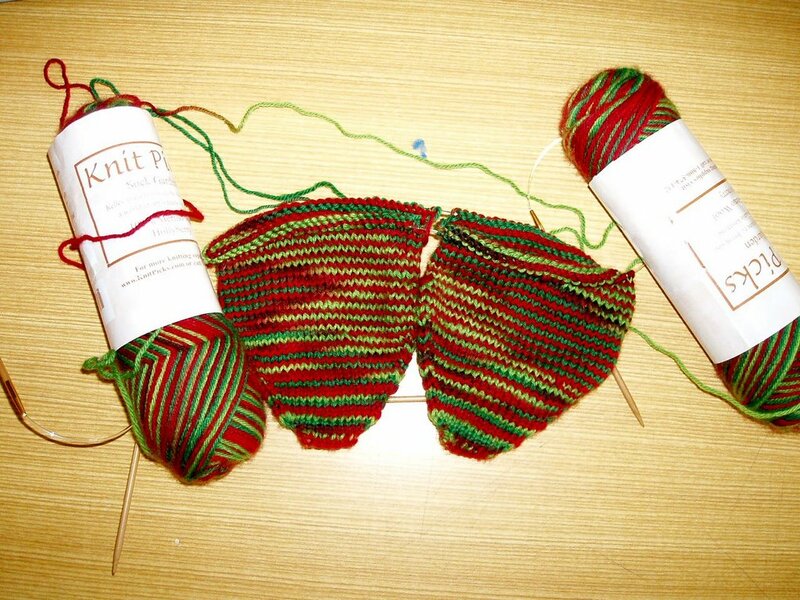 I made a pair of baby mittens and a pair of garter stitch booties yesterday for a friend who's pregnant. Both out of the 2006 calendar and finished in an afternoon. Not much knitting to them. Booties are garter stitch with a longish leg which can be turned down like a sock cuff. Pictures to follow perhaps. It's grey and dark here again today. Not photo weather at all. 2006 Knitting Pattern-a-Day Calendar is a boxed calendar with patterns for most days of the year. Some patterns are spread over more than one day. It is published by Accord in the USA and is available here at Calendar Club stalls in major shopping centres. Their website lists sites and phone numbers. $22.95. Obviously, there are a lot of different patterns. However, I made quite a few of last year's and have started on this years. There seem to be quite a few tanktop type patterns in this year but also socks, baby and childrens etc and stitch patterns. 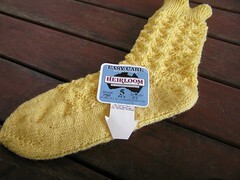 I leave you with the picture of a sock I am working on.. I'll check back in from time to time. today I started my first sock of the KAL, "Classy slip up" from"Knit Socks!" by Betsy Lee McCarthy using Lorna's Shepherd sock in "Bittersweet" ( great minds think alike!) I love these colours and decided that these socks will be for me! The lighting is bad, I know, blows the colours out a bit, but you get the idea, hopefully this stitch pattern will help to defy the colour flaring. Thought I'd drop by to say thanks for this blog and letting me be a part of it. Like I need more WIPs. But I can't help it. I love socks and KALs so what could be better. I'll post some gratuitious sock shots when I can get blogger to co-opperate with me. Happy Sock Knitting to you all. I must be crazy. 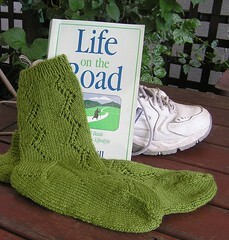 I'd hardly finished the green pair of Winding Roads socks than this was on the needles. Again from the Heirloom Easycare. Perhaps not the traditional sock wool,but it's thicker than many sock wools and I get very cold feet. 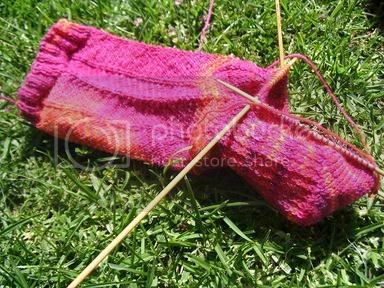 Until last century there was no nylon to add to sock wool, so what's new? I'll probably handwash them, although label says machine can be used. I can give myself that luxury now there are no children in the house with their constant amounts of washing to do. This is the first toe up sock I've actually finished. Usually I get part way through and rip them out. This has a star toe which looks a bit pointy when I examine the sock but actually fits very well. 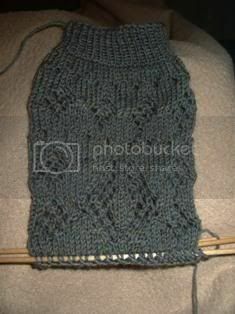 Easy and quick to do too, although it was a jumble of needles for a few rows. The pattern is a vertical chevron of purl stitches. 6 stitches wide and eight rows. I'm enjoying all the other photos too. Whatever did we do before digital cameras?? And crazy? I have other Christmas knitting to do and the six sock KAL new pattern is due out in a few days too. Pics of the socks, basking in the glorious day we've had here today. And being the totally-unable-to-stick-to-one-thing-at-a-time gal that I am, I'm already thinking about the next socks. Probably some footlets (as per Alison at the Blue Blog), I have a small skein of a yarn I want to use, and thought the anklets would be ideal. I've also set us up a Frappr! account, so that we can see where we all are!! My apologies for the late entry, I've been a bit busy!! Great to see so many joiners!!! Hey Taryn forgive me, I read all about your KAL and HAD to join...so I emailed you, ninny that I am I hadn't read my hotmail, thanks for the invite! Can't wait to get started...does this mean I should buy new sock yarn ?? I need to knit more socks as my 3yo keeps nicking mine. 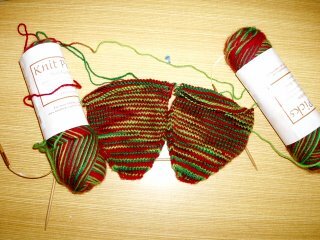 I have knitted 3 pair toe up and 1pair top down. Two had a reverse dutch heel and the others had sherman heels and toes. The top down also had the first kitchenering I have ever done. No dog ears YAY. I guess you can twist my arm! Okay, I need to finish Em's never ending knee highs, then I will stash dive and come up with something to teach myself two socks on two circs. God knows I'd better do something with all this sock yarn! What? Another KAL? Why not I say! And a sock KAL at that! But like many I have been meaning to do some socks for a long long time now. 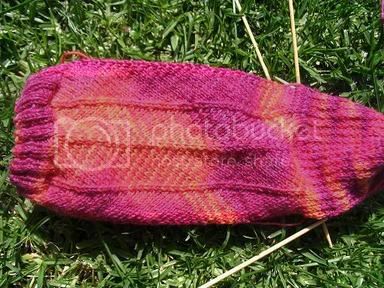 My first pair of socks were made back in (hmm, do I have enough fingers to count back on...) 1996 and I haven't made any since (however I have started and frogged socks twice since then). I'm about to move house and consequently my commute will change from 1/2 hour ferry to 15 minute train, and I have been fantasizing about socks as my new commute knitting - they'll be more suitable for the shorter and bumpier ride. The move is happening in January, so the weather will be goading me in the sock direction as well, I'm sure. So thanks for the motivation, impetus, kick up the seat of the pants - sock world, here I come! I'm not sure what yarn or pattern I'll use but I would like to give this toe-up business a try, and why not throw in a Turkish Cast On while I'm at it? I have been obsessed with the various patterns involving leaves lately (Kiri shawl, Backyard Leaves scarf) so Amelia's Elfine Socks do take my fancy. On the other hand, I have been coveting the lace knee-high socks from Interweave Knits (Winter 2004) for many months, since I saw this picture of them. I will give the yarn question some further consideration during a trip to Melbourne this weekend. Good morning to all on this beautiful morning. I joined up last night after following a trail of links from a comment on a blog. Socks are just perfect for summer. The picture is of my first pair of summer socks, finished yesterday but started in the heat of a week or so ago. I call them my "Winding Road" socks. My own design taken from a cardigan I did for my mother in the 60s! Cardigan was of Bluebell Crepe and is still in good condition. I was looking at the pattern and thought it looked like a winding road. My life has been very twisting this year with lots of potholes and bumps which you can see in the pattern. I just worked the design into my personalised sock preferences. It's Heirloom Easycare 5 ply. I've started another pair, cream, from the same type of wool and have more planned. Toe up which is an experiment for me. 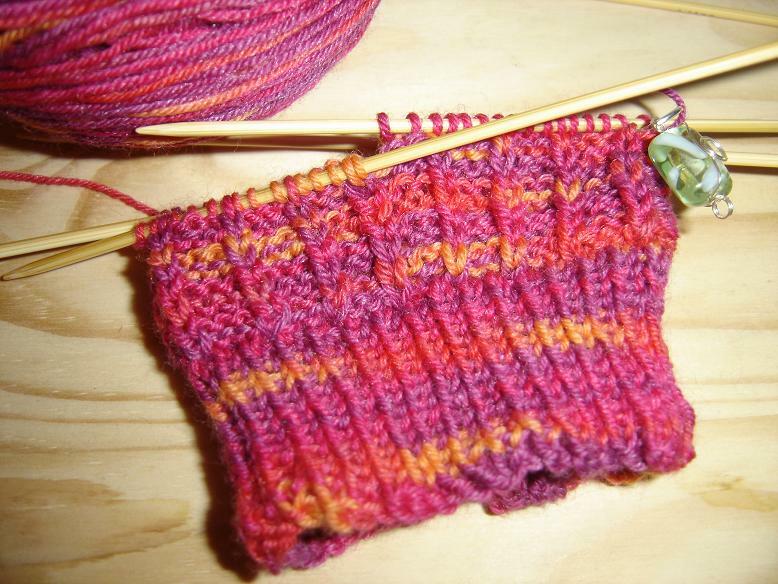 I've just turned the short row heel. Other toe up socks have never reached that point before ripping. Looks like a busy summer! I also have some cotton blends which I haven't used before and may make something for the little granddaughters, 5,3,1. I'm looking forward to seeing what others do. I thing I might do Go With The Flow from Interweave Knits, just because this was what I started to knit when trying out knitting socks for the first time... and then promptly ran out of yarn just as I got to the heal shaping. Handy, no?! As to what yarn, I don't know. I'll have a look in my stash and see if anything takes my fancy. And you all know what it's like to knit in summer. So what a better project to knit in such sweltering humidity? Small, portable, and you can build up your supply in time for winter! We'll be putting links to pattern suggestions in the sidebar, but if you have a fave add it in! This KAL is hosted by Taryn and Alison. If you would like to join or if you have a pattern that you'd like to contribute please send us an email. Thanks!